This is where I post things about my design aesthetics, from furniture design to graphic design. Now, I'd like to mention a couple of the guiding principals I have about design, as well as my approach to writing about these topics. These are fairly important things to keep in mind if you happen across my writings here from out of the wilds of the internet. I am NOT a design professional. I'm an amateur. I've deliberately kept myself an amateur. Probably a mistake on my part, but that's where I am. There is an obvious debate between the freshness of the tyro versus the well established designs of the pro. Mostly, the pro wins, in terms of design language and aesthetics. But in some instances, the language of the unencumbered eye brings some value. That's what I'm attempting to do. A lot of the woodworking and design writing I've seen on the internet in the last few years has taken the stance of "The Instructor". People write in the manner, that "I am the person who will impart wisdom to you." I don't feel that I have the luxury of that role. I'm a guy trying to figure out my design language, and I've decided to do it out in the open. If anybody wants to look over my shoulder while I'm figuring this stuff out, you're welcome to do so. Just don't make the mistake that I know what I'm talking about. But from my perspective, the most interesting aspect of the interview came in the first half, from about the 20 minute to the 45 minute mark. Due to the recent legal difficulty at Gibson Guitars over improperly sourced exotic woods, it's clear that the entire industry has had to take a new look at their wood supplies. And it sounds as if Bob Taylor has done more than anyone to come up with a new way of suppling their factories with the woods they need. If anyone is doing yeoman's work at pointing us all in a new sustainability direction in this area, it sounds like Mr Taylor is at the forefront. It's an interesting listen to hear him talk, with passion and thoughtfulness, about travelling around the world to find the finest woods for his production; to Alaska for Sitka spruce, to three small mountain villages in Honduras for rosewood, and to Camaroon for ebony. It's the latter tale that has the most intrugue, and raised the biggest questions for me. I've resisted adding any actual, working projects to my woodworking portfolio for the past four months, as I worked on clearing my backlog and finishing things up. But I've now opted to create a built-in cabinet for my sister. She and her husband are remodelling a room to be an office space for their growing business, and this was a perfect opportunity for me to try a built-in cabinet design. I guess this isn't really a designed-piece as much as it is an adaptation of someone else's design. I've wanted to build something fairly traditionally Shaker in style, so I used a design by Christian Becksvoort as the basis for this piece. The office is a converted milk house, with a tile wall on one side, and regular sheet rock on the other three. I've spent about 10 hours coming up with a Sketchup design of how I would build it. I started with a basic block shape of where it might go, but then I went into virtual building mode. The model includes the anchor frames for the floor, wall, and ceiling to which the unit will be attached. 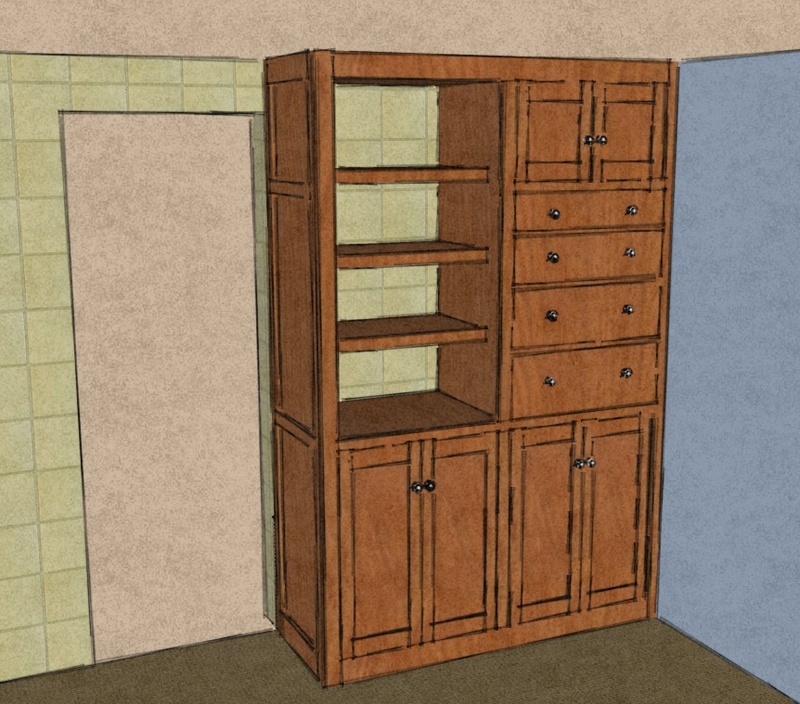 And the joinery of the piece is largely finalized in the Sketchup design, half based on Mr. Becksvoort's choices, but also based on the uniqueness of the install location. Well, now I've done it. For an inexperienced woodworker and art aficianado, I have some serious opinions about design. And yet I've read little of a truly serious bent on the subject. Aside from reading a few of George R. Walker's blog postings and a few articles in Fine Woodworking and other such magazines, I really haven't studied furniture design much. I suppose my thoughts have been more of an, "I know what I like" simplicity. I view this as both a strength and a weakness. But now I've ordered "By Hand & Eye" from Lost Art Press, George Walker's and James Tolpin's treatise on furniture design. Before I read it, though, I feel that I should capture some of my own naive thougts about the topic. I'm hoping that the way that my opinion changes between now and then might be illuminating to me (and perhaps others) on the evolution of design sophistication. On April 19th, 2013, Christopher Schwartz posted an important essay on his Lost Art Press blog called "On Technical Perfection". It asks the question of woodworkers, "Should we focus on being technically perfect, or should we instead focus on the design?" It's a natural topic for him, since Lost Arts is currently preparing a book about just this topic. The book is by George Walker and Jim Tolpin and will be called "By Hand and Eye". It sounds as if it has the potential to be a seminal work. As an input to the design trends discussion, I found this blog posting on the Apartment Therapy website. It's a take on the 'top 100 US Furniture stores by sales' story that was evidently posted as a Furniture Today article. This is about 2 years old, but it seems a valid source of info for what furniture is selling and by whom. I've done logos for a variety of people over the years, but it's always been a casual thing. Mostly they come to me because they don't want to pay a real graphic artist to come up with something. The latest one is for my wife's burgeoning custom jewelry business. She needs a logo for her business cards, website, one sheets, etc. I was thinking. You know, with Chris Schwartz currently focusing on campaign furniture, it had me thinking about other, modern day uses for this kind of design ethos. My understanding of the style is that it is furniture designed of tough woods, but cut thinner than stationary furniture, so it won't be too heavy. It needs to be reinforced at the corners and the latches to withstand travel. It needs to provide compartments to efficiently store whatever the intended contents are. Lee Valley is selling a outside table lamp powered entirely by a TEG, a themoelectric generator. So, the candle burns, heats up the TEG, which generates enough voltage to power 8 LED lights. The result is one tea light that generates as much light as 19 tea light candles. Kind of shows how much energy is wasted by a candle, no? I'm a print design guy (and tech writer) by trade. And my urge in my woodworking (as a hobbyist) is to design pieces and build them . . . slowly, as it happens. But I find myself noticing a certain . . strange, mis-alignment between what woodworkers design and build these days, and what people put in their homes.